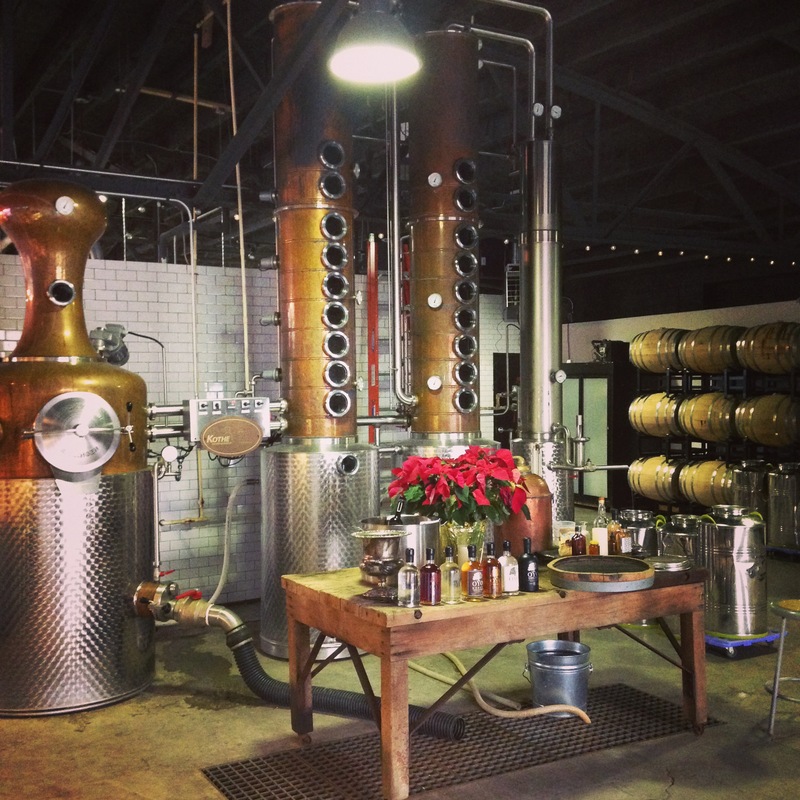 Craft distilling is the biggest thing to happen in the spirits industry since prohibition. In 2005 there were 50 licensed distilleries operating in the United States and in 2012 that number had climbed to 250. At first glance Middle West Spirits in Columbus Ohio looks a lot like many of the other micro distilleries that have opened in that time frame. Owned by a small group of dedicated young professionals who left (presumably) lucrative jobs in other fields to start a distillery, Middle West has the slick marketing, steep prices, and even the obligatory connection to moonshining that I’ve seen at a lot of other craft distilleries. A combination of pot and column stills allow for greater flexibility in the distillation process. Once you get a little deeper into the distillery, you begin to notice the things that make Middle West different. Full sized barrels of their own whiskey aging in the corner. Sacks of grain from Ohio farms. Craft vinegar bottles ready for sampling. Charlie and I visited with one of the owners, Brady Konya, to talk about what makes them different and recorded a great interview. We had a very interesting discussion and were even able to get a few samples of their products for review. So, here are my thoughts after being able to sit down with the Honey Vanilla Bean Vodka, an infusion made with local wildflower honey and fair trade vanilla beans. OYO’s traditional vodka is made with 100% soft red winter wheat and is the flagship bottle of Middle West Spirits. They do two seasonal infusion with the vodka, a stone fruit and the honey vanilla bean. The base spirit is really important to the overall taste of the infusion so let me speak a little bit about what makes OYO vodka different. Most American vodka is very focused right now on being as pure and tasteless as possible which is one of the reasons I don’t really get that excited about vodka. But in direct contrast to this trend, OYO Vodka is very minimally filtered. The flavor of the grain, yeast, and natural sugars come through and it actually makes a vodka that not only has flavor, it is a really complex and pleasurable flavor. So when making infusions with OYO vodka you are not starting with a blank slate. Middle West has clearly been very thoughtful about which flavors to pair with the vodka and it shows. And now for honey vanilla vodka itself. It has a nice body with a creamy mouth feel. The nose is sweet and floral with a clear vanilla scent. On the first taste the honey and vanilla flavors are there but they mingle nicely with more delicate notes of grass and almond. At 80 proof this is a true vodka infusion and the alcohol content is strong enough to stand up to the sweetness. The result is a peppery finish the leaves heat in the mouth but is nicely smooth going down. I really enjoyed sipping this vodka neat but the flavors would also lend themselves to mixing with citrus, pear, or coffee flavors in a cocktail. 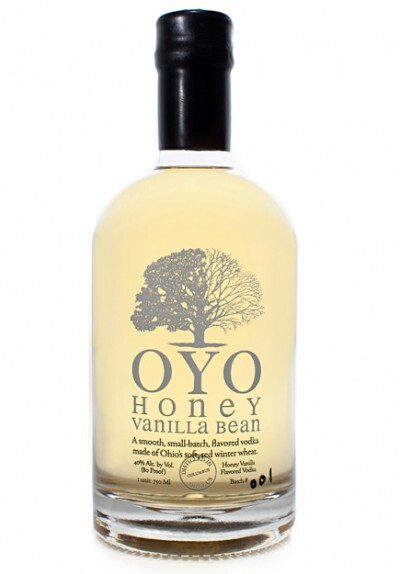 If you want to try the Honey Vanilla Bean Vodka, I will be featuring OYO vodka and bourbon at the Local Beers and Spirits class I am teaching February 4th at Gorman Farms. I’d love to see you there and get your opinion of the Honey Vanilla Bean Vodka as well. love, love, loooove this vodka. have you tried any of their bourbons? equally wonderful. also, the stone fruit vodka is really nice to sip simply over ice while enjoying dessert, definitely comparable to a nice port. Yes, I really enjoy their bourbon. In fact when I do bourbon tastings I like to include it as an example of a craft distillery that is not only making good bourbon but it taking it in an interesting taste direction without being too gimmicky.